Almost all analysts of the gold market that take into account what is really happening behind the scenes are optimistic that gold prices are headed much higher in 2010 or 2011 at the latest. Many, including me, expect to see gold top $1,500 before the end of this year. Along with others, I think there is a solid possibility that gold could even reach $2,000 by the end of 2010 or early next year. There are even more radical forecasts. When Bill Murphy, the chairman of the Gold Anti-Trust Action Committee spoke last month at the American Numismatic Association National Money Show in Fort Worth, the title of his speech reflected his anticipation that the price of gold was going to $3,000 to $5,000. I consider it entirely possible that the value of the dollar may depreciate so far relative to gold that the price of gold could go to eye-popping levels against the US dollar. 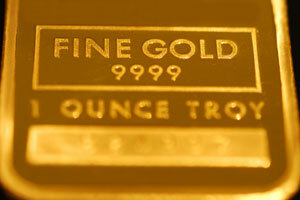 Even as I say that, I don’t think there is any chance that the price of gold could reach US $5,000 per ounce by the end of 2011. For gold to reach that level in the next 20 months, that would imply that the value of the US dollar would have to drop by more than 75%! Long before the dollar would fall so much that the price of gold reached $5,000, the US dollar would cease being the mainstay unit of account for international commerce. Once the dollar was no longer wanted by foreigners, a flood of currency and US-dollar denominated assets like bonds would flood back into the US. This would have the effect of accelerating the decline of the dollar. So, long before the price of gold could rise to $5,000, I would expect the dollar to collapse. If the US government did not also collapse in conjunction with the failure of the currency, then an entirely new monetary issue would be created. Should the US government be unable to create its own new circulating medium, as happened to Zimbabwe’s government in 2009, the free market will establish its own standards. Whether the replacement monetary system is created by the US government or by the private sector, I am confident that the use of gold or silver would be necessary to establish credibility and stability. Should the US dollar be in such dire straits that it might threaten to reach $5,000 by the end of 2011, there would certainly be many other problems in the US. There could be civil unrest on a scale greater than anything seen since the Civil War. The consequences for the standard of living for many Americans may be devastating. We can only hope, if things deteriorate that much, that the populace would respond as relatively peacefully as they did in Indonesia in 1997. Although Indonesians fortunate enough to own gold or silver managed to largely sustain their previous standard of living, most citizens held only paper money and were wiped out. Despite the overall financial calamity, Indonesia survived in comparative calm. Even a few members of Congress have privately stated that the debt and liability burden of the US government, now more than $100 trillion dollars on an actuarial basis, is so large that we are past the point of ever being able to save the US dollar. I wish they were wrong in this assessment, but I am fearful that they are right. What if they were to reconnect the dollar and gold and rate it at 5k or better in order to return stability to the fiat currency? Of course I suppose that would mean that they would have to have the gold to back it up and I’m starting to think that is doubtful. This is another of those “Gloom and Doom” scenarios like you get from Glen Beck as he sells gold for Goldline to an anxious public. While precious metals are increasing in value, I seriously doubt that you will see $2,000/oz. in the foreseeable future. We have not seen massive inflation. We have not seen a dollar collapse, and the dollar is actually increasing in value relative to the Euro. Many of the companies and institutions that got bailouts are paying them back and stocks are increasing in value. Notice that Heller does not give the names of the “Gloom and Doom” Members of Congress. Fiat currency is here to stay and no other currency is likely to supplant the dollar in international trade soon! Heck, the Chinese do not want their currency to reach its true value because it would weaken their export trade. Coincidentally, they want a strong dollar to protect their investments. Contrary to what most people in this country believe, the precious metals gold, silver, and now copper will provide a safe haven for those interested in protecting their future. There is nothing available in the stock market unless you make 2 for 1 after taxes every month or two. I don’t think even the best stock investors can consistently make 2 for 1 year after year. Everyone boasts about 401K plans that will never provide the true intended effect due to inflation of a fiat monetary system. What will be the buying power of $1 million in a 401K account 30 years from now? Personally, I would rather place $10,000 per year in gold and silver each year and have tangible assets that I can convert to the current dollar or monetary system and spend without additional penalties and taxes. It is great to see at least some of you are finding your senses about the true state of the economy. After reading about the GOLD market for 8 years 2-4 hours a day…….this post and all posts by Pat Heller are the best on the planet……GOD bless you mr.heller. Richard do post on every forum on the ……. planet? Your a psycho! Thanks for your concern GJ. No. I am not psycho. I simply draw my conclusions from the world of reality and common sense. You know the economy is terrible when major universities start laying off trusted and dependable employees with 30 plus years of service. The economy is in a dismal state. Think about this. What good is funding a 401K every payday only to buy high and the day traders run away with your profits. It will take an eternity to accrue true wealth in such a system with the current fiat monetary system we have in such an ever-inflating market. I appreciate your opinions. I post on many of these forums in hopes that others will do the same and we can all learn from each other. Actually Richard it is best to be diversified! Their are many ways that one can become impoverished and one of them is to ” have all your eggs in one basket”. I believe that owning and investing in precious metals can be a smart move as long as you balance that with stocks and bonds. Bubbles can occur in any investment venue and you can never tell when that might occur. A balanced portfolio is best able to absorb the “slings and arrows of outrageous fortune” so to speak. My problem with the Heller article is that the source is a person who stands to benefit by his advocacy. I do not take stock advice from Goldman Sacks and I do not base my metal investment decisions on salesmen. I also avoid advice from used car salesmen. I have tried to invest wisely with strong diversification Steve. I fund my 401K 23% of my pre-tax income. My investments after taxes include gold, silver, and rare coins. I try not to place all of my eggs in one basket. However, the 401K plans that once looked promising now look like a highly-fashioned savings account that loses money, requires annual commission payment from the funder, and is taxed upon receipt of payment while in retirement. I am sure that by the time I retire, taxes will have been increased enormously, and my net payment will amount to nothing. At least precious metals have a more direct impact to conserving true personal wealth by being a tangible asset that a person can take ownership of and physically have in possession. If the stock market crashes and the monetary system fails (a very strong possibility), precious metals will continue to have value. I agree with your attitude toward precious metal investment, but I do not think that the US fiat system will implode. Government in this country can do many things to manipulate values and the monetary system. First and foremost it can protect itself from the “doom” scenario. Besides, if the apocalypse actually happens, a bag of gold coins may not be edible. Our nation has its problems, but we have faced greater risks and prevailed in the past. Some of what Heller and others are selling is fear to encourage sales. That is my area of objection. The fact is that I do like precious metals in spite of the people who sell them with fear and hype. I find your disparagement of Pat Heller absurd and completely unwarranted. It would seem that you did not even bother to read his article, as he downplayed and attempted to refute the more extreme near-term predictions of $5000 gold, NOT bolster them. But in any event, you read to me more like the classic head-in-the-sand American who denies the increasingly grim reality with desperation, using such strawman words and phrases as “gloom and doom” and the “apocalypse” to try to disingenuously paint those who advocate holding precious metals in the face of enormous financial and monetary upheaval and uncertainty as radicals and extremists. And just because we have not seen massive inflation yet (actually we technically already have, in the Fed’s balance sheet) does not mean that we will not see it tomorrow. Your entire argument seems to rely on bluster, strawmen, and appeals to authority. Wake up! I keep reading that people think there is a relationship between the value of fiat currencies and the precious metals like gold and silver. This thinking is 100 years out of date at best and this thinking must stop because it is insanity and foolishness. The truth is that except for some old coins made out of gold or silver there are no US Dollars. The same principle would apply for other currencies. So now that we have dispensed with sham and pretense what do we have? We have Fiat currencies which represent debt and or just plain printing of currency that has no unit of currency representing ounces of gold and silver. There is no ratio. All the fiat currency does not represent wealth it represents debt and or nothing. To have a proper currency you must have only coins made out of gold, silver for large denominations and copper /copper nickle for small change and absolutely nothing else. Any other way and you have a crime in progress. The reason why metal prices are the way they are is that special interest groups are fixing the price in a range that they are willing to tolerate so that the public can believe that the currency they use has buying power and value. It is a confidence game to maintain profit and power for entrenched special interest groups at the expense of everyone else. It is an utterly stupid situation that has nothing to do with truth or reality and it must end for the good of mankind.